Most signing systems use signs from British Sign Language (BSL) which is the language used by the hearing impaired community. Makaton or Signalong use signs from BSL, but in a simplified form for people with a Learning Disability. The core words in a sentence are signed, accompanied by the spoken word. 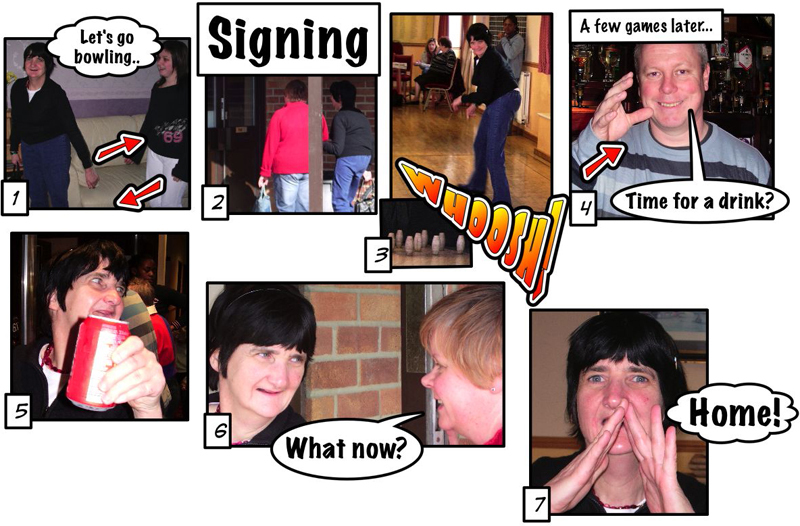 How does Signing help with communication? Visual information is easier to process in the brain than auditory information. Signing helps to gain and maintain attention, and aids understanding by reinforcing the spoken message. It encourages the speaker to slow down and use simple language. It helps those with hearing loss to understand more, and helps people with unclear or limited speech to express themselves. You can request a “signs of the month” package from The Oxfordshire Speech and Language Therapy Department. Every month you will be mailed with a new set of four signs. The “signs of the month” can be posted on a notice board for everyone to see and learn to use. Makaton/ Signalong / Fingerspelling. What’s the difference? Makaton is based on BSL and was devised by Margaret Walker in the 1970s. It provides a basic means of communication using speech, sign and symbols to encourage language development in children and adults with communication difficulties. Signalong is another system with its own set of signs. Fingerspelling is used to spell out the names of people and places in BSL. In Makaton and Signalong we sign just the first letter as we speak the name; for example the letter ‘M’ for ‘Mandy’. Where can I learn some signing? Contact us at OTC for information about courses in signing.